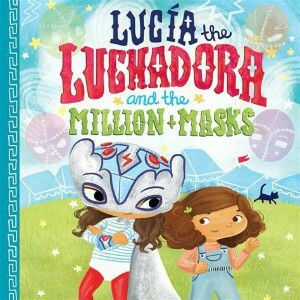 This is a book review of Lucía the Luchadora and the Million+Masks by Cynthia Leonor Garza. Disclosure: We received a copy of this book in exchange for an honest review. This post contains affiliate links. Summary: Lucía’s little sister Gemma wants to be a luchadora like her, but she is more bumble and splat than pizzazz, and seems to find trouble wherever she goes. When Gemma makes a ginormous hole in her big sister’s special silver mask, Lucía is exasperated at how she seems to get away with everything. But a trip to the mercado with Abuela presents the sparring sisters with a dazzling array of possibilities: MORE masks and identities to explore! When Lucía realizes she’s misplaced her special silver mask, a frantic search ensues with Gemma’s help, and Lucía discovers that some things, including troublemaking little sisters, are one of a kind. This is a follow up book to the original Lucía the Luchadora but can be read on it’s own. I didn’t read the first one but this one at least doesn’t explain what a luchadora is so I had to explain it to my kids first. I’m guessing the first one explains it. After read the book to my 4 and 7 year old, my 4 year old wanted a mask and cape of her own. She wants to be a Luchadora just like Lucía. It’s a sweet little story that would be especially good if you have two little girls as it illustrates a nice sisterly relationship. After reading it you could ask your girls to remember a time they got mad at each other. Remind them how Lucía realized her sister didn’t mean to make her angry and how Gemma did something to make up for it. The book could be a lesson. The illustrations are beautiful and very colourful. Lucía the Luchadora and the Million+Masks is a nice addition to our bookshelf.